Jolt is another cycling novel, written on the move. This time it was 1999, my year of travelling through Europe. I remember vividly writing the first few sentences, culminating in the strangling of two pet rabbits, on the plane trip out of Wellington. The story itself took hold earlier in the year, when, in my last school teaching act before taking leave, I was hiking with a group of senior Physical Education students. The trip was the same one undertaken by the teenagers in the novel, across the top of an unforgiving mountain range. In the real life version high winds forced us back and we took an alternate route out through bush. We became temporarily lost during the last hours of daylight, and when we finally emerged at the river bed we’d been heading towards, it was properly dark. I said at the time, I’ll use this in a novel one day. Will we be in it? asked Marko. Marko is the name of the main character, and of the rest of the group, Johnny also survived, both in name and temperament. A good portion of the story was written in my first few weeks in London, and the rest came together during summer months cycling around the back roads of France. Hours of pedalling in the morning gave me the perfect opportunity to ponder, and then by afternoon, with the tent pitched, I could write it all down, usually whilst prone by a river or lake, or on a beach. Not a bad way to put a story together. This novel owes a great debt to John Marsden’s Tomorrow When the War Began, which shows so perfectly the narrative appeal of a group of teens fighting for their lives in the wilderness. In my case, a major earthquake was the way into the plot, and again I played around with structure, having Marko wake up in a psychiatric ward, sure the doctor means to kill him. As he writes down the story of how he came to be there, we switch back and forth between this cat and mouse game on the ward, and the journey through the bush that brought him here. The aim with such a structure is to bring the two parallel stories together at a single memorable point. This comes close, but doesn’t exactly nail it. Years later, I spent some time working with a British film director trying to get a screenplay for Jolt off the ground, and during that process we found the perfect turning point, the moment I should have used in the novel. As with Lester and Redcliff, Jolt is at heart a novel about revenge. I’m still not sure why it is I felt the need to mine the theme during that burst of writing, beyond the obvious dramatic tension available with an emotion that the audience both has an instinctive feel for, and disapproval of. In terms of that theme, this is the novel of the three that explores it most fully. It’s also, I believe, the novel that sold best for me in New Zealand. 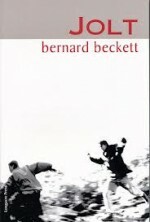 Later it was published in Australia and Germany.